Little did I know, summers spent in junior golf clinics at Hillandale Golf Course in North Carolina would catapult me into a lifetime of fun, adventure, and friends and eventually develop into a career in golf. Along with 40+ kids, at the age of 10 I was enrolled in a clinic on a weekly basis where we received an hour of instruction then played 18 holes. When not in the clinic, I would ride my bike across the bridge over the interstate with Sonny Mills, pay a mere $3.50 and get 36 holes in each day. 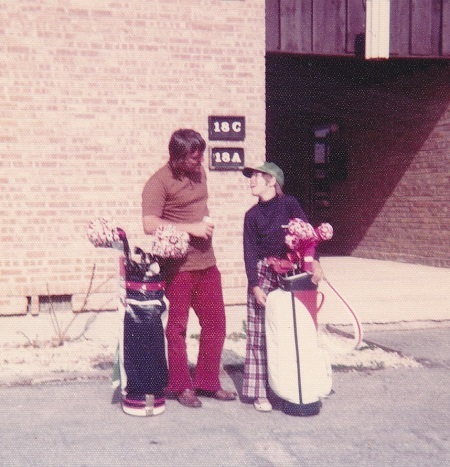 As golf became a sport I enjoyed, I joined Duke University Golf Club as a junior member at 13 years old. I met new friends, played and practiced often with golf team members at Duke, and played in club events with a variety of adults. One kid I played often with was Karl Blackwell. We practiced and played against each other all summer long. My parents played some golf but most of my family golf influence came from my grandparents. They played often with fellow members at their club. It was always a lot of fun to visit and play golf with them. I remember one of my early goals was to play well enough to beat them. One day I was playing with my grandpa and the club pro; I beat the pro on one hole. I was one excited kid! Playing golf and golfing with adults at an early age helped give me the life structure I have today. Hand-in-hand, golfing with adults, I learned how to be social in a public setting, interact with people, and to get along with others. Golf has rules, etiquette, and processes. Life is similar. In golf, if you’re out of bounds you’re penalized. Life’s the same way. One can take short cuts and/or cheat, but when you’re tested, the short cuts aren’t there to help you. As kids we had games to play at the mall arcade but it wasn’t a lifestyle, it was a place to hang out once in a while. We never spent hours in front of a computer. We socialized outside, and for me and friends, it was at the golf course. 1. Anyone Can Play: One doesn’t have to be lean, strong, or fast to play golf. Golf champions come in all shapes and sizes. Unlike most other sports, you can enjoy golf your entire life and it’s never too early to start! 2. Minimal Risk: Golf is a noncontact sport. The chances of injury, especially serious ones, are very minimal. 3. Safe and Positive Environment: The golf course is a safe place and facilitates relationship development. Golf helps teach right from wrong in a supportive environment. 4. Lifelong Friendships: You never know who you will meet on a golf course. It’s one of the easiest places in the world to make friends as everyone has that common thread. Golf helps foster a unique bond so those friendships can be developed all over the world and last a lifetime! These are the people you want your kids hanging out with! 5. Prepare for Business: It’s hard to think about it now, but kids grow up and the people they meet as children can play a huge part in their success later in life. Golf is a sport that helps prepare kids and teens for careers in business and other professional arenas. As I mentioned earlier, I was learning about real-life business every day from all the adults at the age of 13 that I played with. 6. Spend Time Outdoors: In today’s world of video games and smart phones, child obesity is a concern nationwide and it can be hard to drag your son or daughter out of the house. Golf is the perfect excuse to spend an entire day enjoying nature and presents the opportunity to develop healthy, lifelong exercise habits! 7. Important Life Lessons: Golf closely parallels real life. The range of experience, from birdies to bogeys, from good shots to bad, rewards a young person’s ability to keep each shot and each round in perspective, manage one’s emotions, maintain a positive outlook and focus on the shot at hand. A child will learn integrity, discipline and respect. As they learn to conduct themselves on the golf course, these lessons will translate directly into everyday life. 8. Scholarships: Golf can open doors academically as they persevere and improve their game. Scholarships are out there to help advance their education. 9. Family Time: Golf is a game that encourages family participation. Golf is an opportunity for quality bonding time, and it’s one that can last a lifetime. 10. FUN: One of the best reasons to get your child, son or daughter, involved with golf is that they’ll have an absolute blast. It’s a chance to learn new skills, both physical and mental, make new friends and discover new opportunities. This time of year there are a million things you can buy your kids, but only a few make a real impact. Let golf be one of those impacts. Perhaps a few clubs or balls under the tree this year?